The bitter cold on Friday January 16 failed to hamper the generosity of a group of NIEHS employees who transported donated food to a shelter for the homeless in Durham, NC. 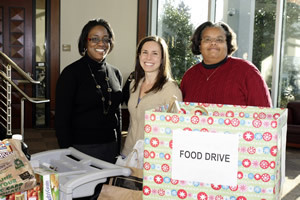 The effort was spearheaded by employees in the NIEHS Division of Extramural Research and Training (DERT) via the Community Builders Committee and members of the Research Triangle Chapter of Blacks in Government (BIG) (http://www.bignet.org/) , an inter-agency service group, who collected food over the Christmas and New Year's holidays. Friday turned out to be the coldest day so far this year in central North Carolina with lows in the teens and single digits. It was the kind of day that inspires shelters to fly a white flag to indicate that everyone who needs a warm place to sleep will be accommodated. With temperatures that low, there is a real danger that people sleeping outside could suffer hypothermia, frostbite and even death. With the white flag flying, shelters also experience an increased need for food. "We [in DERT] wanted to do something for the holidays," said Worker Education and Training Program Administrator Sharon Beard. 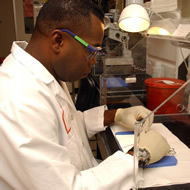 "We took care of everything over here in Keystone [the satellite facility where more than 300 NIEHS employees have offices], and BIG handled collections on the main campus." Beard joined NIEHS Project Officer and BIG President Veronica Godfrey, DERT Health Science Administrator Caroline Dilworth, Ph.D., and Superfund Basic Research Program Program Administrator Heather Henry, Ph.D., in the lobby of the Keystone Building. There they loaded the food and left for the Durham Rescue Mission (http://www.durhamrescuemission.org/) , which has seen a dramatic rise in demand for services through its Operation Warm Shelter with the downturn in the economy. Last reviewed: 02 February 2009.